Champagne Open House: Saturday, April 2nd, noon to 5pm. The artists will be present from 3 - 5pm. Sam Gilliam first took his paintings off their stretchers in 1965, using the liberated canvases to transform gallery walls into three-dimensional abstractions. He has continued to experiment with the practice of painting and the line between painting and sculpture. For this exhibition, Gilliam will transform the 8,000 square foot space of the third floor of the American University Museum at the Katzen Arts Center into an exciting and colorful work of art. Sketch features sketchbooks created by 16 DC based artists working in a variety of different mediums. As part of Sketch, Transformer will host a series of artist talks, and "draw-ins" led by artist Reuben Breslar. On Sunday, April 3, the Podestas invite Collector's View guests into their home to see newly installed photographs, paintings, and sculpture by ten German artists. 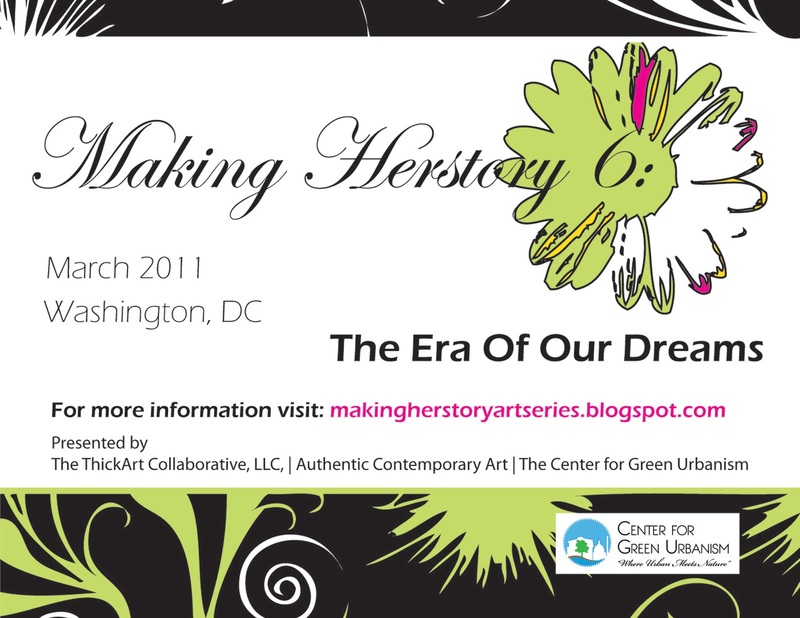 To register, contact Alison Konecki at alison(at)transformergallery.org or 202.483.1102.
on level 2 next to Embassy Suites Hotel. ZARTiculation, commemorates Zenith’s 33rd year in the nation’s capital, the gallery will present its trademark mix of artworks by more than 40 artists, many who have been with the gallery since its early beginning. ZARTiculation, at Chevy Chase Pavilion will be on display throughout the Pavilion and in Zenith’s own gallery on level 2 next to Embassy Suites Hotel. Artists featured in the exhibition include: John Aaron, Fabiano Amin, Bert Beirne, Caroline Benchetrit, Jay Burch, Pat Cochran, Rosetta DeBerardinis, Renée duRocher, Joel D’Orazio, Eric Ehlenberger, Ken and Julie Girardini, Robert Freeman, David Glick, Margery E. Goldberg, Stephen Hansen, Christine Hayman, Philip Hazard, David Hubbard, Robert C. Jackson, Susan Klebanoff, Joan Konkel, Shelley Laffal, Michael Madzo, Chris Malone, Michela Mansuino, Michelle Marcello, Anne Marchand, Donna McCullough, Bill Mead, Marianne Mitchell, Davis Morton, Reuben Neugass, Carol Newmyer, Laney Oxman, Zachary Oxman, Guenther Riess, Greg Schaffer, Ron Schwerin, Sica, Ellen Sinel, Karen Starika, Paula Stern, Bradley Stevens, Cassie Taggart, James Tormey, Ray Wiger, Marcie Wolf-Hubbard, Paul Martin Wolff and Joyce Zipperer. New with this exhibition, Zenith will host a series of art classes, lectures and demonstrations several Saturdays a month, conducted by some of the participating artists. Sponsored by the non-profit Zenith Community Arts Foundation, the classes will be held in Zenith’s gallery, with times and dates to be posted at www.zenithgallery.com. Scheduled, to date, are a “Soft Sculptures” class with Chris Malone for adults and children on Sunday, April 30 and two “Golden ArtistColors Lecture Demonstrations” for adults, conducted by painter Rosetta D’Berardinis on Saturdays, April 23 and May 14. These classes will be from 1:00-3:00 PM, followed by a “Meet and Greet the Artist” from 3:00-5:00 PM. Also in the works will be a sculpture class with Carol Newmyer, a collage and encaustic class with Marcie Wolf-Hubbard and a presentation by Margery Goldberg on art collecting. Inspiring speech for the arts! Keynote Speech by Mira Nair, acclaimed filmmaker, at a dinner honoring the 2010 National Arts and Humanities Medalists, hosted by the President's Committee on the Arts and Humanities. The lecture will examine the work of these two celebrated painters and their personal friendship, which endured over several decades. Professor Gail Levin is the author of Edward Hopper: An Intimate Biography, Becoming Judy Chicago, and many other books on twentieth-century and contemporary art. She is Distinguished Professor of Art History, American Studies, and Women’s Studies at the Graduate Center and Baruch College of the City University of New York. Her forthcoming book, Lee Krasner: A Biography, released March 22nd, 2011, details the life of Lee Krasner, an Abstract Expressionist painter whose work was sometimes overshadowed by that of her famous husband, Jackson Pollock. Grace Hartigan’s warm relationship with MAP during her lifetime culminated in the bequest of five paintings upon her death in 2008. A longtime resident of Baltimore and an influential figure in the city’s cultural life, Ms. Hartigan is celebrated in MAP’s exhibition, Grace Hartigan: A Memorial Tribute, on view at the Ritz Carlton Residences. Free for current members, all others $10 at the door. Friday, April 1, 2011 5:00 p.m. – 7:00 p.m.
Adam Dwight’s gouache paintings and rubber puddle collide with Dana Jeri Maier’s ink drawings on drink coasters for Off in a Corner, a two-person show that manipulates the line between fine art and illustration. When juxtaposed, Dwight's and Maier’s farcical and cartoonish narratives reveal a dark absurdity to the characters and relationships depicted within. The exhibition brings together works that explore issues of drinking and adulthood as influenced by the artists’ mutual interest in biography and narrative. JAYME MCLELLAN is an artist and curator living and working in Washington, DC. She is the founding director of Civilian Art Projects, a gallery representing emerging and established artists located in downtown Washington just north of Chinatown. The Joan Hisaoka Healing Arts Gallery is inviting artists to submit to their OPEN CALL. Located in the heart of DC's historic U Street corridor, the gallery is in the midst of developing an Art Advisory, a full-service entity of the gallery, which will serve corporate and individual collectors, with a special focus on corporate clients in the healthcare setting. The Joan Hisaoka Healing Arts Gallery currently seesk submissions by painters, photographers, sculptors, printmakers, muralists, installation and new media artists to support our developing advisory services and future projects. Individual art works will not be selected from the call; rather, they will invite selected artists to be non-exclusively represented by the Advisory. Chosen Advisory artists will work with the gallery to sell existing works or to create commissioned pieces specific to future clients’ needs. Adam Natale, Director of Partnerships & Business Development at Fractured Atlas, will speak about key services, programs, and resources that can help artists with the business side of their art -- the "unsexy" side that artists generally do not like thinking about, but allow them to focus more easily on the creation of their art, while also maintaining the infrastructure of their "arts business." To start, Adam will introduce the services offered through Fractured Atlas, a national, nonprofit arts organization that provides fundraising, education/professional development, insurance, and other services to both performing and visual artists. Adam will then talk about other local, state and national organizations that offer similar resources on arts advocacy/civic engagement, fundraising, jobs in the arts and arts administration, tips on grantwriting, social media/new technology, networking, emerging arts leaders, and general career and resume guidance. We are looking forward to a lively Q & A! DC-based Sarah Tanguy, curator at ART in Embassies, US Department of State as well as an independent curator and arts writer, will explore the expansive role of the curator in the emerging artist's career. Sarah Tanguy will cover various methods on how to approach, get the attention of and develop an ongoing relationship with a curator. She will also compare the role of the curator with that of a gallerist, and contextualize the place of an emerging artist in a global art community. Claire Huschle, Executive Director of the Arlington Arts Center, will give visual artists advice on how to structure early career steps in terms of showing work and building a reputation among galleries and curators. Don't forget to mark your calendar! The Professional Development Speaker Series is a succession of lectures and workshops given by established artists and art professionals to aid in the artistic and entrepreneurial development of all So-Hamiltonian Fellows and other emerging artists. All talks begin promptly at 7pm and take place at Hamiltonian Gallery. Washington DC-based music duo Bluebrain's latest release is not a standard album in the sense that it can be listened to passively in one sitting or, for that matter, at any location. It is a site-specific work of music that responds to the listeners location within the stretch of park in downtown Washington DC known as the National Mall. The album will be delivered as an app for the iPhone. ‘The National Mall’ works by tracking a users location via the iPhones built-in GPS capabilities. 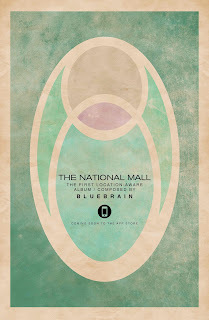 Hundreds of zones within the Mall are tagged and alter the sound based on where the listener is located in proximity to them. Zones overlap and interact in dynamic ways that, while far from random, will yield a unique experience with each listen. The proprietary design that is the engine behind the app will stay hidden from view as the melodies, rhythms, instrumentation and pace of the music vary based on the listeners’ chosen path. ‘The National Mall’ is an ambitious project that will allow users to listen to and interact with a work of music in a way that’s never been possible before. ‘The National Mall’ is the first in a series of location-aware musical works that Bluebrain will compose and design for sites around the world in the coming months and years. The second work of this nature, designed for Prospect Park in Brooklyn, New York will debut later this summer followed by a piece that will stretch the entire length of California’s Highway 1. ‘The National Mall’ will be available in the Apple App Store in the coming weeks. Bluebrain is the Washington DC-based music duo of brothers Hays and Ryan Holladay. In addition to performing live and releasing traditional albums, they have gained a reputation for executing unique projects throughout the city. They’ve been commissioned to create works for The Smithsonian, The Corcoran, and The Phillips Collection in the two years since they began. arteaméricas, the premier fair of art from Latin America, will be returning for its ninth consecutive year to the Miami Beach Convention Center. Starting on Friday, March 25th through Monday, March 28th, 2011, arteaméricas will showcase the latest trends in paintings, sculpture and multimedia from contemporary artists as well as renowned masters at the Miami Beach Convention Center. “arteaméricas has been the most respected Latin American art fair since its inception. We’re proud of this distinction, and for that reason, we raise our standards every year, create innovative projects and recruit the best galleries out there,” says Leslie Pantín, President of arteaméricas. Friday, March 25 12 p.m. – 9 p.m.
Saturday, March 26 12 p.m. – 8 p.m.
Sunday, March 27 12 p.m. – 7 p.m.
Monday, March 28 12 p.m. – 5 p.m.
On Saturday, March 26, the Corcoran Gallery of Art and College of Art + Design, along with partners Transformer and the National Coalition Against Censorship will present Culture Wars: Then and Now, a FREE one-day symposium examining past and current debates about freedom of expression and public support for the arts. "In light of recent censorship by the Smithsonian Institution and threats by congressional leaders to pull arts funding from national arts institutions, including the National Endowment for the Arts, Culture Wars: Then and Now presents very timely conversation examining how freedom of expression and public support for the arts are currently being debated," said Victoria Reis, executive and artistic director of Transformer. Culture Wars: Then and Now will examine censorship in four unique discussions: Censorship Examined, Culture Wars Redux, Give Me a Revolution: Artists' Responses to Censorship, and Free Speech & Arts Funding. "We are convening this symposium because the fear of controversy and subsequent institutional self-censorship that come in the wake of a censorship incident are much more dangerous than the incident itself," said Svetlana Mintcheva, director of programs at the National Coalition Against Censorship. All panels will be held at the Frances and Armand Hammer Auditorium from 10 a.m. to 5:30 p.m. on Saturday, March 26 and are free and open to the public. "The Corcoran is pleased to partner with Transformer and the Coalition to put this important discussion, and subsequent dialogue, on the center stage, where it belongs," said Corcoran Director and President Fred Bollerer. Marshall Reese of Ligorano/Reese Collaborations and a participating panelist in Culture Wars said: "During the first week of December, I had this strange sense of déjà vu. Once again, politicians were censoring a major art exhibition, and it was even the same artist, David Wojnarowicz. It was almost as if I had been asleep for the past 20 years. And yet, it's become clear, this isn't just some weird Twilight Zone like aberration; it's the onslaught of an attack on not just our civil liberties, but with what's happening in Wisconsin on the American way of life." To further punctuate aspects of the conversations taking place throughout the symposium, video works via Franklin Furnance's The History of the Future! A Franklin Furnance View of Performance Art will be shown in the Corcoran Atrium during the lunch break and between panel sessions. A reception for panelists and attendees will follow in the Corcoran Atrium from 5:30 to 6:30 p.m. Pre-registration is encouraged; to register, visit https://getinvolved.corcoran.org/culturewars. The Professional Development Speaker Series is a succession of lectures and workshops given by established artists and art professionals to aid in the artistic and entrepreneurial development of all So-Hamiltonian Fellows and other emerging artists. All talks begin promptly at 7pm and take place at Hamiltonian Gallery. A conversation between Margaret Parsons, Curator of Film at the National Gallery of Art, Andrew Simpson, Resident Film Accompanist for the National Gallery of Art, Brian Clyne of Brian Clyne Studio, and artist Sharon Louden will follow immediately. National Gallery of Art Or call: (202) 737-4215, ext 7. Out of Order!, MAP's annual spring benefit exhibition, silent auction and party! Tuesday, March 29, 7am-Midnight, www.mdartplace.org/exhibitions/upcoming. Freya Grand "Another Journey" & Amanda Stark "The Astral and Tellurian"
Dana Jeri Maier and Adam Dwight manipulate the line between fine art and illustration in Off in a Corner, opening Friday, April 1 at Flashpoint Gallery. The exhibition brings together works that explore issues of drinking and adulthood as influenced by the artists’ mutual interest in biography and narrative. Studio H presents Pablo Caviedes’ first solo show in Washington, DC which will open Saturday April 2, 2011 from 6pm to 9pm to the general public. The show runs through May 29, 2011. Cavides’ upcoming exhibition at Studio H Gallery entitled Mannequin is comprised of new work that explores the dichotomy between the natural and the artificial. The symbolic imagery used in his paintings and sculptures refer to what Caviedes calls “fakeness”— often humorous commentary on societal fascination and obsession with virtual, artificial life that mimics natural human forms. 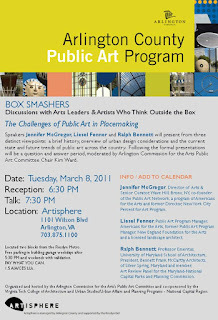 Curated by Gina Marie Lewis, Assistant Professor of Art, Bowie State Univ. Featuring work by Anne Bouie, Daniel Brooking, Joel D'Orazio, Victor Ekpuk, Corwin Levi, Barbara Liotta, Adrienne Mills, and Cleve Overton. Curated by Gina Marie Lewis, Process: Reaffirmation is an exhibition which focuses on and reaffirms the processes of artists within their studios. This exhibition honors the personal philosophies, practices, and vocabularies of eight artists and attempts to explore a visual dialogue between their works. The show GREEN WORKS at Project 4 Gallery features artists who remove paint from their palette and look to the recycling bin for their medium and inspiration. Wood recovered from construction sites, plastic utensils retrieved from a back alley, bottle caps, junk mail, recycled aluminum, and paper made with site-specific ingredients replace traditional artist materials. "WATER AND LAND" PHOTOGRAPHS BY LEE GOODWIN"
Washington Design Center's 2011 Dream Home, Jewel Tones of Design Opening Friday, March 18 and running through December, Washington Design Center's 2011 Dream Home: Jewel Tones of Design have brought together renowned eight interior designers to use jewelry as their inspiration for their room décor. Seven local jewelers and a jewelry designer helped the team choose the perfect piece. It's free and open to the public. Come see them for yourself! The Contemporary Museum will explore social changes and movements that revolutionized the art world during the 1950s with its Critical Perspectives discussion series, “Revolutionary Road: How the Art of the Fifties Paved the Way for Today’s Art,” beginning Tuesday, March 22, 2011. The six-week course will reveal how radical new art forms challenged the notion of suburban tranquility, and encouraged artists to embark on life-transforming personal quests. Critical Perspectives will examine the rise of such influential groups and artist collectives as the Nouveau Realisme of France, Gutai of Japan, and the Fluxus and Happenings artist networks in the United States. The series will also explore the era’s emerging art forms, including junk culture and experimental photography, as well as revolutionary installation strategies. An overview of the seminal figures who taught or studied at the renowned though short-lived Black Mountain College will provide insight into the great artistic minds of the 50s and the new forms of expression they pioneered. 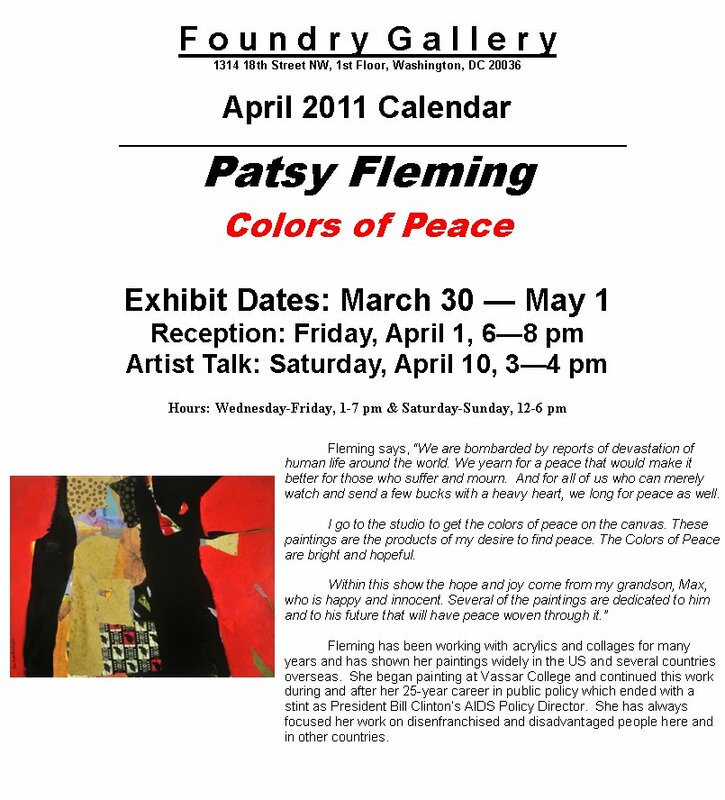 The series will convene every Tuesday, from March 22 through May 3, 2011, excluding April 19, at 6:15 p.m. at the Contemporary Museum. Critical Perspectives will be led by Virginia K. Adams and Sue Spaid. Ms. Adams is a modern and contemporary art history instructor at Maryland Institute College of Art. Sue Spaid is executive director of the Contemporary Museum. This is a ticketed series. For more information about Critical Perspectives and the Contemporary Museum, visit www.contemporary.org or call (410) 783-5720.
for information about the Georgetown Library click here. Artists can make a living independent of a gallery. This Mini Boot Camp will be a hands-on intensive professional practice workshop in which Ms. Louden will provide guidance with respect to: galleries; understanding the world of public art; applying for grants and navigating application proposals of all sorts; general marketing strategies; pursuing jobs in the arts; how to research and "find the money"; basic professional correspondence; creating a great presentation package/portfolio; the basics of writing a resume and a solid artist statement; and, creating a realistic set of goals that are flexible enough to evolve over time. Sharon's perspective focuses on creative thinking outside the box and following different avenues to create opportunities and income without spending a fortune. Sharon feels the ultimate goal is to achieve professional independence, confidence and empowerment. Sharon M. Louden graduated with a B.F.A. from the School of the Art Institute of Chicago and an MFA from Yale University, School of Art. Her work is held in major public and private collections throughout the United States, Asia and Europe. Sharon teaches professional practice at the New York Academy of Art and lectures on this topic at many universities, art schools and museums across the country. See Sharon Louden in person at The National Gallery of Art, Ciné-Concert: Art in Motion! Sunday, March 27, at 5:00 p.m. Louden's new digital creations Footprints, Hedge, The Bridge, and Carrier are accompanied by live piano and percussion compositions. All the works presented are "whimsical, drawn-in-space creations that come alive and create their own narratives." This is a WSG-Sponsored Event. She has had numerous solo shows, in New York, Paris, London, Washington DC, Los Angeles, San Francisco, Brussels, Hamburg and over 200 group exhibitions. Her works have also been shown in numerous museum exhibitions and collections. In 2007, Lilya received the prestigious Leopold Senghor Art Prize. The application deadline is April 10, 2011. I ran across a new, fresh yogurt, parfait bar in Dupont Circle this month, Food for Thought, Yola. Green, green, green. I'm loving their lowfat Greek yogurt! All of their yogurt selections are unbelievably fresh. And if you prefer to drink your lunch, you can order a fruit and yogurt smoothie. Heavenly! An extra bonus is the yogurt and espresso bar is housed in a chic well designed, light filled space on Connecticut Ave. NW that runs the full length to the back door opening onto 18th Street. They also serve soy chai and a vegan yogurt. There's free internet for patrons, lots of seating and friendly staff to help you with your yummy selections. I like my parfait topped with fresh blueberries, blackberries and occasionally granola. And best of all, Yola is art friendly! The Bourgeon editorial Board has selected the five finalists and a jury of professional critics including Washington Post critics Michael O’Sullivan and Anne Midgette will select the winner. The contest, which closed on Feburary 15th, 2011, will culminate in the awards ceremony. All five finalists will be at the event, and the winner will be notified live during the presentation of the award. The awards ceremony is being hosted by Yola, a fresh (not frozen) yogurt parfait and espresso bar located in the heart of Dupont Circle. Yola is run by father/daughter team David and Laura Smith. Laura, who is herself a Bourgeon contributor stated, "I am thrilled to have the opportunity to host the awards ceremony at Yola. I had always envisioned Yola as a gathering place for the arts, and I can't think of anything better to gather around than celebrating young talent in arts journalism…. In the modern publishing environment quality journalism and arts writing can often be obscured by flashy headlines, and there is no better time than now to celebrate young talent." Founded in 2005, Bourgeon’s mission, through an online publication and community initiatives, is twofold: to increase participation in the arts and to improve access to the arts. Bourgeon is a project of the non-profit Day Eight. To see more about Day Eight please visit www.dayeight.org. Visit the Bourgeon magazine site at www.bourgeononline.com. This winter, Flashpoint Gallery began a collaboration with the Smithsonian American Art Museum to present 30-minute talks given by Flashpoint Gallery exhibitors, alums and other DC-area artists as a part of the museum's Art + Coffee series, held in the Luce Foundation Center. At the Smithsonian American Art Museum (F St. entrance). Talks are at 1:30pm on select Sundays. Talks include: March 20: Juan Tejedor • April 10: Adam Dwight & Dana Maier • May 22: Isabel Manalo • June 12: Judy Byron • June 19: Matthew Mann. This exhibit of original hand-pulled prints—etchings, screenprints, monotypes, and mixed-media prints—comprises diverse images with grasses as their theme. The etching “Wide Grass” is presented in a number of variations, including single images, multiple images, and combinations of a number of prints in hanging cascades. The etching “Grass Bouquet” is combined with screen printing to create mixed-media prints. 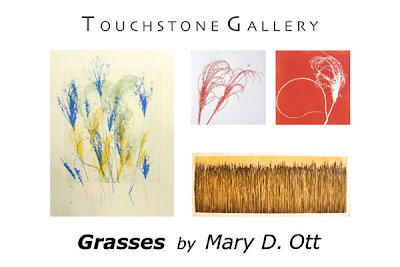 Monotypes that are part of the series “Bouquet of Grasses” are displayed in an array that highlights their bright and contrasting colors. The prints are all variations on the theme of grasses. Touchstone Gallery is located in a wonderful street-level space at 901 NY Ave., NW, Washington, DC 20001. When you tour the DreamHome, be sure to take a look at Andy Staszak's Family Room inspired by Adeler Jeweler's 1st-century B.C. Roman silver coin earrings. Andy's room also features my work "Swirl," courtesy the artist and the Art Registry. The Washington Design Center announces the 2011 DreamHome, which will incorporate the jewelry of eight local jewelers and designers. Eight Interior designers have chosen pieces from each jeweler that will inspire their room design. The 2011 DreamHome will be unveiled at a preview party on March 17th and will remain open through December 9th. The 2011 DreamHome, residing within The Washington Design Center, will offer “bejeweled” decorating inspiration through furnishings, fabric, rugs, and wall coverings available throughout the design center’s showrooms. Master Bedroom – Zoe Feldman, Zoe Feldman Design, Inc. Dedicated to providing the finest in home furnishings to the design trade, The Washington Design Center houses nearly 50 wholesale residential, commercial and building products showrooms and is considered the mid-Atlantic region’s largest resource and destination for the design industry. The Washington Design Center is located at 300 D Street, SW in Washington, DC. Above the Federal Center SW Metro Station, The Washington Design Center is served by the Orange and Blue lines. To learn more about the 2011 DreamHome, The Washington Design Center, and its showrooms, programs and special events, call 202.646.6100 or visit the Design Center online at www.dcdesigncenter.com. Stay up to date on new products and events with the WDC blog, www.dcdesigncenterblog.com. What are your journeys, and how do they finish when you come back home? How do they start? Traveling across land, sea, the inner mind, an emotional field, expanses of time – beginning, end. 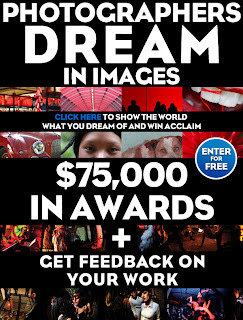 All artists, 18 years of age or older residing in the Washington, DC metropolitan area are eligible to enter. Deadline for submissions is April 15, 2011. JUROR: Jack Rasmussen completed his MFA in Painting, MA in Arts Management, and PhD in Anthropology at American University. He has been presenting contemporary art on the east and west coasts for most of the last 35 years and is currently Director and Curator of the American University Museum. ENTRY: Selections for the show will be made by the judge from JPEG images submitted by the artists. All work must be original and signed by the artist. Any work previously shown at a Capitol Hill ART League juried show is ineligible. All work must have been created within the last three years. ENTRY FEES: Up to 3 entries may be submitted for a non-refundable fee of $25 (Current Capitol Hill ART League members $15.) Up to two additional entries may be submitted at $5 each. Artists submitting 3-dimensional work may provide two images of each piece. Arturo Montoya was born in Miami, Florida on October 19, 1957. He was raised in Puerto Rico, Venezuela and the United States. He attended High school in Caracas, Venezuela and studied Architecture at the University of Nebraska -Lincoln. He obtained his Bachelors degree in Architecture in 1981 and his Masters in Architectural Design in 1984. 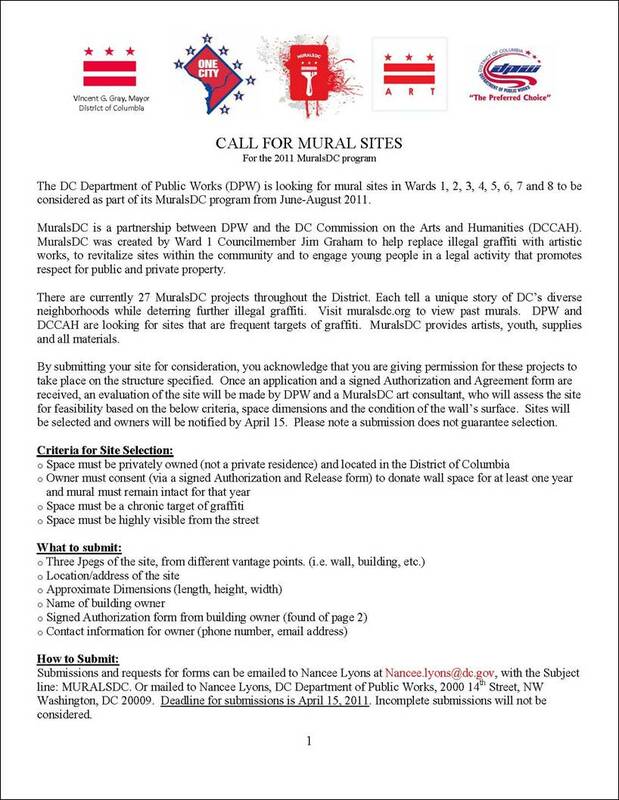 The DC Department of Public Works (DPW) is looking for mural sites in wards 1, 2, 3, 4, 5, 6, 7 and 8 to be considered as part of its MuralsDC program from June-August 2011. MuralsDC is a partnership between DPW and the DC Commission on the Arts and Humanities (DCCAH). MuralsDC was created by Ward 1 Councilmember Jim Graham to help replace illegal graffiti with artistic works, to revitalize sites within the community to engage young people in a legal activity that promotes respect for public and private property. Visit muralsdc.org to view past murals. There are currently 27 MuralsDC projects throughout the District. Each tell a unique story of DC’s diverse neighborhoods while deterring further illegal graffiti. Visit muralsdc.org to view past murals. DPW and DCCAH are looking for sites that are frequent targets of graffiti. 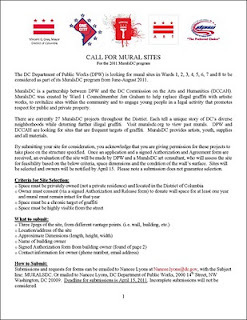 How to Submit: Submissions and requests for Authorization forms can be emailed to Nancee Lyons at Nancee.lyons[at]dc.gov, with the Subject line: MURALSDC. Or mailed to Nancee Lyons, DC Department of Public Works, 2000 14th Street, NW, Washington, DC 20009. Deadline for submissions is April 15, 2011. Incomplete submissions will not be considered. is this Saturday, March 12, 3-5pm. This will be the last chance to view it at Harmony Hall Arts Center, located at 10701 Livingston Road, Fort Washington, MD 20744, 301.203.6070. Now until April 6th, The Joan Hisaoka Healing Arts Gallery is inviting artists to submit to their OPEN CALL. The Joan Hisaoka Healing Arts Gallery currently seeks submissions by painters, photographers, sculptors, printmakers, muralists, installation and new media artists to support our developing advisory services and future projects. Individual art works will not be selected from the call; rather, they will invite selected artists to be non-exclusively represented by the Advisory. Chosen Advisory artists will work with the gallery to sell existing works or to create commissioned pieces specific to future clients’ needs. McLean Project for the Arts's biennial juried art exhibition, Strictly Painting 8. April 11 Deadline for submission receipt (4 pm) . Juror: JAYME MCLELLAN is an artist and curator living and working in Washington, DC. The Trawick Prize: Bethesda Contemporary Art Awards is now accepting applications for the annual juried art exhibition and awards. $14,000 in prize monies is awarded annually to the top four artists and a group exhibition of the finalists work will take place in September 2011 in downtown Bethesda. The 2011 competition will be juried by Amy Hauft, Chair of the Sculpture Department at Virginia Commonwealth University; Dr. Sarah Newman, Curator of Contemporary Art at the Corcoran in Washington, D.C.; and Sue Spaid, Executive Director of the Contemporary Museum in Baltimore, MD. PLANNING PROCESS is a juried drawing show with a difference: All of the drawings selected for inclusion must be studies created in preparation for finished artworks. Juror: Helen Allen, former creator and Executive Director of PULSE Art Fairs, former Executive Director of Ramsay Art Fair, and current partner for the upcoming (e)merge art fair in Washington DC. Artists can submit images of up to three projects, and four preparatory drawings per finished project. The juror will pick as many projects from a given artist as she likes, and as few or as many studies connected to each project that she would like to feature. - This show is open to cutting edge contemporary artists working in any/all media, and who live or work in Virginia, Washington DC, Maryland, West Virginia, Delaware, or Pennsylvania. Deadline: March 31, 2011. 1708 Gallery invites artists to submit work for the second 1708 Gallery Feed Biennial. This national juried exhibition is open to any professional or graduate student artist working in any medium. 1708 Gallery is a non-profit contemporary art space in Richmond, Virginia whose mission is to expand the understanding, development, and appreciation of contemporary art by giving exposure to both emerging and established artists. This exhibition will feature multiple works by the top 5 entries as selected by jurors Lauren Marinaro, Assistant Director, Zach Feuer Gallery, New York and Elizabeth Schlatter, Deputy Director and Curator of Exhibitions at the University of Richmond Museums, Richmond, Virginia. Each of the 5 finalists will receive a $1000 honorarium. To enter, visit www.1708feed.org. The National Center for Children and Families (NCCF) invites your support as they gear up for the 9th Annual Art & Soul Charity Auction, "Masterful and Gifted" on Friday, June 3, 2011. NCCF is accepting submissions of art work for both the Inaugural Youth Art Fair, “Gifted, Artistic, and Under 21” and the 9th Annual Art & Soul Charity Auction, “Masterful and Gifted”. Each artist may submit up to 3 pieces for review. Only original works of art will be considered, including but not limited to painting, drawing, photography, sculpture, and mixed media pieces. Approximately 100 works of art will be selected for each event. 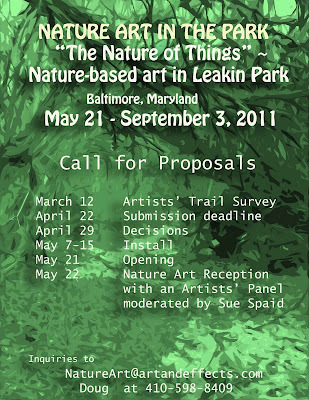 Nature Art in the Park will be an outdoor summer exhibition of nature-based art installations along the trails and campus grounds of the Carrie Murray Nature Center in Gwynns Falls / Leakin Park- Baltimore’s largest urban forest. The project is an independent artists’ endeavor to promote art that acknowledges & honors the natural world and our place in it. 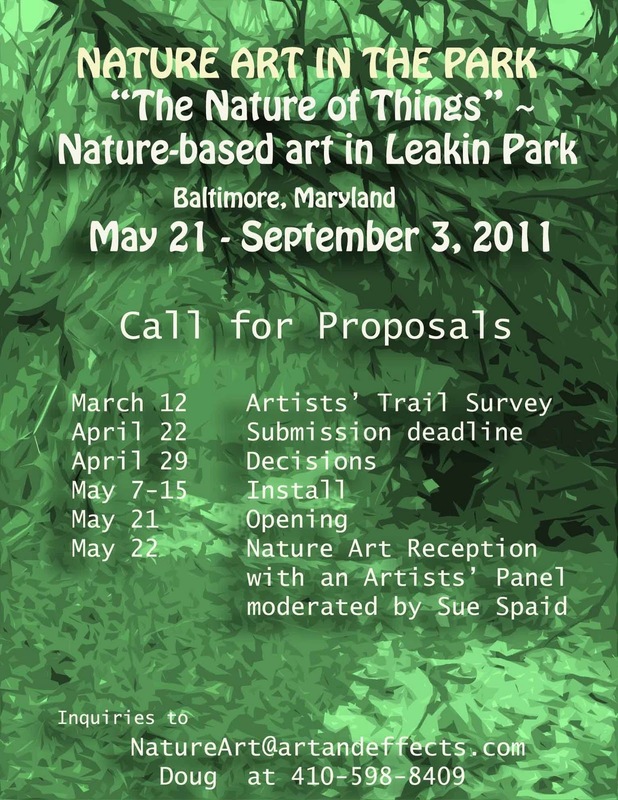 We are soliciting artist proposals for nature-based and generally site-specific works. To facilitate a global community’s participation, we will support non-physical, conceptual and documentary elements with display at the center. Thursday, March 17th, at 7:00 pm: artist talk with Joyce Y-J Lee. Hamiltonian Gallery presents At Last, an exhibition of new works by Hamiltonian Fellow Joyce Y-J Lee. In this latest series, Joyce Y-J Lee oscillates between mediums, utilizing video, drawings and digital prints created during the time she recently spent in the Amargosa Desert in Nevada located on the edge of Death Valley. Living and working amongst the hauntingly beautiful landscape as well as the local residents of this small mining community, Lee has yet again produced introspective works that highlight the use of light as meaning. Pop culture and coffee will set the mood at the Contemporary Museum’s next Contemporary Café, featuring a cupping hosted by Spro and the unveiling of the museum’s latest New View storefront window installation, “Totems” by artist Jim Lucio. The installation will explore Lucio’s lifelong fascination with disposable pop culture, hoarding tendencies, and how material things often come to define their owners. The window will be a monument to visual clutter, wrapped with images from Lucio’s personal collection of ephemera, film stills and other visual graphics. Totem poles will be erected from collected materials and found objects including old toys, lamp parts and other pop cultural debris. Lucio will discuss the newly-commissioned piece during Contemporary Café. Participation in Contemporary Café is $5 for the general public and is free for members of the Contemporary Museum. 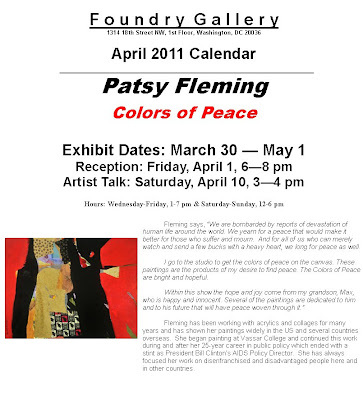 “Totems” will be on display through Sunday, April 3, 2011. For more information about the Contemporary Museum visit www.contemporary.org. Wednesday, March 16, 7:00pmBelgian artist Hans Op de Beeck explores problematic relationships with time, space, and each other through a wide variety of artistic media, including sculpture, painting, drawing, installation, photography, video, animated film, and short story writing. He talks about his recent work, including his video Staging Silence, 2009, on view in Black Box through March 27. February 24 -- May 15Though long celebrated throughout Europe, the influential postwar painter Blinky Palermo (German, b. Leipzig, 1943; d. Maldives, 1977) has mostly escaped America's notice. This is the first comprehensive survey of his work in the United States. Thursday, March 31, 8:00pmFilmmaker, musician, and writer Paul D. Miller (aka DJ Spooky That Subliminal Kid) is this year's judge for the WPA's international competition. He shows his favorites and tells you how he selected them from hundreds of submissions. "Water Marks," "Carnivalé," and f11's "Room of Our Own"
Exhibitions and events are free and open to the public. 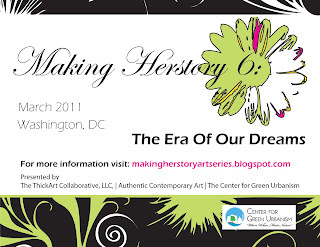 Authentic Contemporary Art and The Center for Green Urbanism is collaborating with The Thick Art Collaborative for Making Herstory 6, a celebration of the creativity of women during the month of March. Washington, DC; March 1-31, 2011. The Trawick Prize: Bethesda Contemporary Art Awards is accepting applications for the annual juried art exhibition and awards. $14,000 in prize monies is awarded annually to the top four artists and a group exhibition of the finalists work will take place in September 2011 in downtown Bethesda. Artists must be 18 years of age or older and residents of Maryland, Virginia or Washington, D.C. Original painting, drawing, photography, sculpture, fiber art, digital, mixed media and video are accepted. The maximum dimension should not exceed 96 inches in any direction. No reproductions. 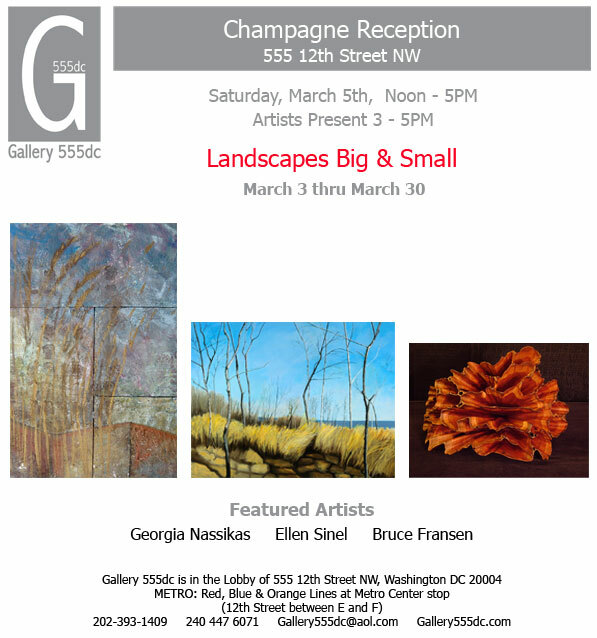 Selected artists must deliver artwork to exhibit site in Bethesda, MD. All works on paper must be framed to full conservation standards. Each artist must submit five slides or five images on CD, application and a non-refundable entry fee of $25. Please visit www.bethesda.org or call 301-215-6660, ext 16 or call 301-215-6660, ext 16 if you would like additional information. The mission of McLean Project for the Arts is to exhibit the work of emerging and established artists from the mid-Atlantic region; to promote public awareness and understanding of the concepts of contemporary art; and to offer instruction and education in the visual arts. Monday, March 14, 2011 4:30 p.m.
Artomatic Takes Flight opens at the Gallery Walk at Reagan National Airport on March 10 as part of the Metropolitan Washington Airports Authority. The exhibit showcases an un-juried selection of work by 81 artists in Washington DC's creative community. Music and performance by GRAMMY nominated Christylez Bacon, Acoustic Showcase featuring Melissa Branin, Danni Rosner, and Bobbie Allen and a chance to win tickets to Cirque du Soleil TOTEM. Call for Entries: Open to all artists 18 years or older working or living in Virginia, Maryland, DC, Delaware, Pennsylvania, or West Virginia. To Enter: Each entry requires an on-line application through Juried Art Services. 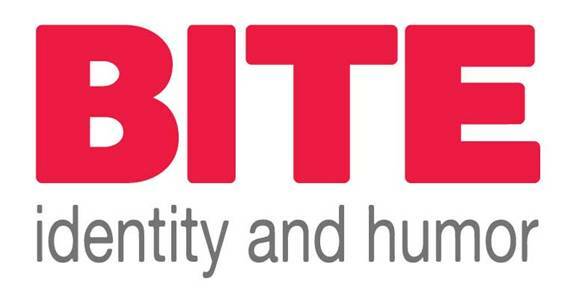 Exhibition Theme: “BITE: identity and humor” asks artists to use irony, sarcasm, and wit to shed light on issues of personal struggle in mainstream society. Artists are asked to create and share work that challenges historical, societal, and cultural norms that dictate expectations of who we are supposed to be. The selected work does not have to be “funny” as much as insightful. About the Juror: Jefferson Pinder is a Washington-based video artist who seeks to find black identity through dynamic circumstances. His experimental videos and films feature minimal performances that reference music videos and physical theatre. Although he considers his work to have a regional style, he stresses the universality of his themes and travels around the globe seeking inspiration. Pinder recently spend time in Senegal, Mexico and Vietnam working on projects that deal with race, identity and social mobility. 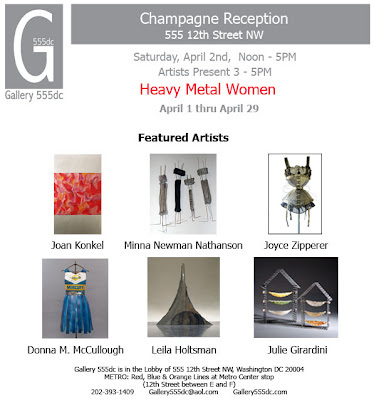 About the Venue: Greater Reston Arts Center is one of the premier non-profit gallery spaces in Northern Virginia with a 37 year history of presenting thought-provoking exhibitions accompanied by stimulating educational programs. The arts center has an open contemporary space, concrete floors, moveable walls, and large store front windows offering 24 hour views from the street. Selected works, including video, will be visible at night. Each year Raandesk Gallery hosts an international competition in photography with a specific theme. The theme, Staged, was selected by one of the jurors for the 2010 competition and served as a single word platform for photographers to present their work. The exhibition is comprised of photographs created by the top five finalists of the competition and serves to be dramatic as well as insightful into each artist's individual definition of the theme. Does gender define art? Traditionally, recognition and gallery space have been harder to come by for women compared to their male counterparts. “A Room Of Our Own,” a photography exhibit opening March 1, 2011 at the Pepco Edison Place Gallery in Washington, DC, proves talent is not the root of the discrepancy. Sponsored by The Art League in Alexandria, VA in honor of Women’s History Month, “A Room Of Our Own” features more than 50 outstanding images created by the 18 members of f11, A Women’s Photography Collective. “The images are as rich and varied as the methods used to make them, reflecting the different perceptions, styles and processes of f11’s members,” stated Rose O’Donnell, Gallery Director for The Art League. Gallery Hours: Tuesday – Friday, 12:00 noon – 4:00 pm. Also open Saturday, March 12 and March 26, 12:00 noon – 4:00 pm. 1900 N. Ft. Myer Dr., Arlington, VA 22209. Vintage images from the Civil War and of the Washington region will be among 1000s of historic photographs for sale at the 28th annual D.C. 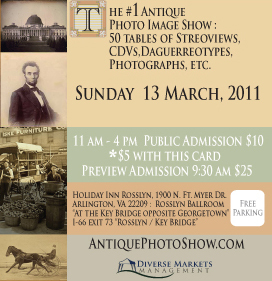 Antique Photo Show. The Focus Project, a yearly competition seeking compelling photography. 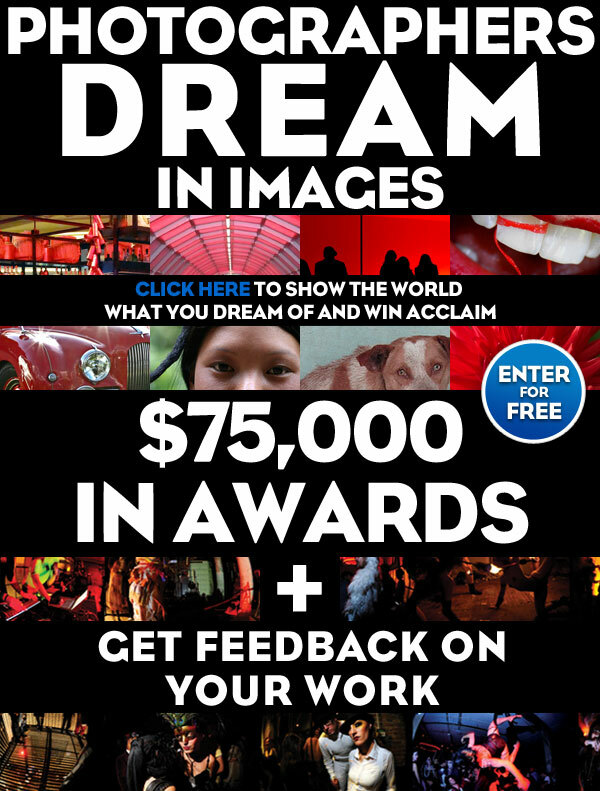 Throughout the course of The Focus Project, selected photographers will be prominently featured on our homepage and have a chance at life-changing awards, world-wide acclaim, a red-carpet New York City reception and more than $75,000 in awards to fund your passion: taking incredible photos. REFLECTIONS is inspired by local artist Bob Benson and his work at the American Visionary Art Museum. The ARTiculate Arts have used similar techniques to create their own "Mirror Art." Gallery and Artist Reception: March 10, 2011 from 5:30p.m.- 7:30p.m. VSA ARTiculate Gallery is located 1100 16th Street NW Washington DC.. Opening reception Friday March 11, 6-8 PM. Photojournalist Ramzi Haidar launched the project Glimpse to bring together photographers, journalists and artists with children ages 5-12 in Palestinian refugee camps in Lebanon. The children worked with these volunteers for one year to learn the basics of photography. The images they produced with their camera are entirely their own, giving them a power to reveal a reality rarely seen. Large scale photos and books about the project are on display at the Jerusalem Fund Gallery.